The pirouette was used in the times of man-to-man fights to make the horse turn on the place. This way, the rider could prevent being attacked from behind by staying face-to-face with his opponent. Mastering pirouettes was therefore important to survive in battle. In the baroque period, riding became an art and the skills of horse and rider were demonstrated in the pirouette. The pirouette is the smallest hindquarter-in circle. The hind legs stay in the centre of the circle and the shoulders make a larger circle. This way the pirouette is a turn around the hindquarter. Ride hindquarter-in on a circle and make this circle smaller. In this exercise, it will become very clear when the strength and the mental limits of the horse are reached. The circle should not be made smaller than the horse can do. 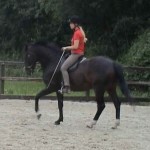 When the horse can canter controlled and collected it can be asked to make the circle smaller in hindquarter-in. At first just ask a few steps, reward the horse and make the circle bigger again. A carré is a square circle on two tracks. The rider rides hindquarter-in and in every corner of the square he makes ¼ pirouette (90° turn). In total, the rider rides 4 time ¼ pirouettes, making a full pirouette in 4 phases. First practice in walk and then in collected canter. A turn is a 180° turn around the hindquarter in walk along the wall and is also called a half walk pirouette. It is important that the rider decides the number of steps and not the horse. It is also important to keep the lateral bending. 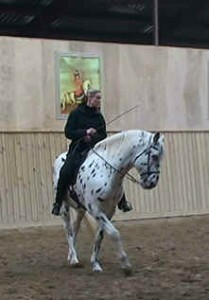 When the horse has learned to do the half-pass in canter on both leads correctly, then the strength in his hindquarter will be developed enough and the horse will be capable to do ½ pirouettes during the half-pass. When the horse is able to do ¼ and ½ pirouettes properly, the pirouette can be expanded to ¾ pirouettes and finally the horse will both physically and mentally be able to o a full 360° turn.